The rock legend will perform at the Irish music festival, London Feis, which is being staged in Finsbury Park in June. It will be his only UK appearance this year, according to organisers. The Fleadh ran for 14 years until 2004, and festival boss Vince Power has now revived the idea for Irish and international acts with Feis to take place on June 18. 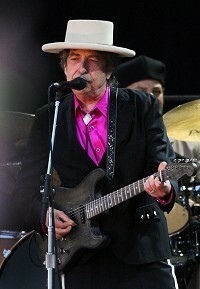 Vince, the founder of the Mean Fiddler Group who has also launched the Hop Farm Music Festival, said: "The inaugural London Feis will be a fantastic edition to the capital's summer calendar and announcing Bob Dylan for an exclusive UK performance means that the first year will be one to remember. "I've worked with Bob many times before and am delighted to have him back once again." Ticket details are at www.londonfeis.com.